For each of these I would like to talk about an inherent danger and an inherent opportunity. Because this one observation looks like it will be way too long for one blog post, I'm going to split it up into four, one for each of these methods of interaction with narrative. In theory, telling a great story seems like a perfect way to achieve goals. In practice, things are rarely so simple. I'm often amazed by the way people talk about stories as if they were levers or buttons people can pull or push to make an impact or have an effect. One example is the tension between "cultural" and "public" diplomacy. According to Richard Arndt in his book The First Resort of Kings, cultural diplomacy involves the respectful exchange of cultural treasures, while public diplomacy is closer to public relations campaigning. This review of the book calls the distinction "between two-way exchange and storytelling" (which is sad, because storytelling didn't use to deserve such a bad rap). Arndt maintains that while cultural diplomacy has been used to mutual positive effect in the past, in more recent years American diplomacy has been mainly of the "public" kind. "We're behind when it comes to selling our own story and telling people the truth about America." Here's my opinion about it, and I'm afraid it's going to be blunt. Anyone who advocates telling a better story to achieve a goal, if that is all they advocate, is being naive at best and dangerously misleading at worst. There are no green fields in the land of stories; every available spot is occupied and contested. There are no story-free environments. When a new story is launched into the world, the stories it meets do not simply watch as the newcomer descends; they rise to meet it and swarm around it in complex, unpredictable and sometimes baffling ways. If an idealistic metaphor for telling a purposeful story is pulling a lever or pushing a button on a compliant machine, a more realistic metaphor is sending a bee into a hive. Stories that are ill-prepared for the hive may fail and die; but that is not the greatest danger. The greatest danger is that the new story may set a pattern in motion that endangers all of the people whose lives depend on the hive. "... to further the accessibility to and the understanding of American performing arts and culture, especially in developing countries or those emerging from conflict and isolation or lacking opportunities for cultural exchange and dialogue with the United States." This group puts on "formal and informal performances of uniquely American genres such as Jazz, Blues, Broadway Musical Theater, Hip Hop, Break Dancing, Stepping, etc" and aims "to inspire and train the next generation of teachers and community arts leaders". Now I'm sure that the people running American Voices are sure that they are doing a good thing, and I'm sure that they are doing something good. But let me ask you this. Have you ever sat in a quiet little cafe in a non-American city, sipped the local beverage, pondered how to eat the local delicacy, enjoyed the musical hubbub of non-English conversation all around you, and - jarringly - heard American popular music (yes, including Jazz, Blues, etc) blaring in the background? If so you will know that this particular story may not meet with a quiet hive. When I'm in places like this I always ask the locals: where is your music? Why is American music playing here? And they always reply that all the cafes play it because they assume people will prefer it. A lot of the people I've talked to hate listening to it, but they say they are powerless to stop it. They laugh about it and are resigned to it. Still, I'm not sure that dumping more American music around is beneficial to anyone. Maybe the reverse would be more useful. "American Voices has brought hope and inspiration to local students, teachers, performing artists and audiences thirsting for such contact and educational opportunities with American artists." So all the world is thirsting for American music! That's not what I've heard and seen. The arrogance of saying that Americans will "inspire and train" people in American music, as though no other music existed -- well, I'm sorry, but that makes me feel very uncomfortable, if not actually angry. In fact I think this and other efforts like it are a perfect example of the danger in telling a story in order to tell a story. I can remember when I first got started listening to world music (otherwise called "music") and the revelation it was to a narrowly educated American. I was listening to some indigenous music recorded in a tribal ritual somewhere in Africa, and it suddenly hit me - and only Americans will understand what a surprise this was - that this music was not "primitive" or inferior to American or European music in any way. It was in many ways more sophisticated and intelligent and beautiful than anything I'd ever heard. At that moment I realized that my musical education was pitifully bereft. But no, these people are "uneducated" and not yet "inspired and trained"! Why, they must be simply parched for American music! If I was in charge of giving out awards for storytelling in cultural diplomacy, I'd give one to Putumayo. Putumayo is a record company that has almost single-handedly introduced Americans to world music. Putumayo has even had the temerity to tell the true story of how "uniquely American" music has roots in and connections with vibrant musical traditions in many other places in the world. Several of Putumayo's many compilations explore such connections, such as "Afro-Latin Party", "Congo to Cuba," and their "Odyssey" series, which follows musical patterns as they travel around the world over time. Several other compilations bring together music from many cultures around common themes like "Women of the World," "Blues Around the World", "World Groove," "World Playground," and "A World Instrumental Collection." The musical education of children who listen to these and other world music compilations will far exceed that of my generation. They will drink from many springs and be well nourished. In the face of this rich web of connections, the methods of the American Voices group seem uninformed (if not deliberately propagandist). I'm afraid that groups like this may not be fully aware of the swarm of stories that are gathering around their apparently well-intentioned efforts. Yes, perhaps young people who are "educated" in American "culture" are often temporarily grateful, and yes, it's true that many young people around the world look at the United States as some sort of heavenly place. (I've met some of them.) But I'd also speculate that every story of cultural enrichment spawns five stories of disillusionment and resentment, over time. The swarm rises. I'm excited to see more and more people doing this sort of hive-centered storytelling. An example is community-centered drama therapy, also called Theatre of the Oppressed or participatory community theatre. In this work people help members of communities tell their stories and combine them into coherent works that communicate the reality of their situation both to others outside the community and self-reflectively back to the community itself. 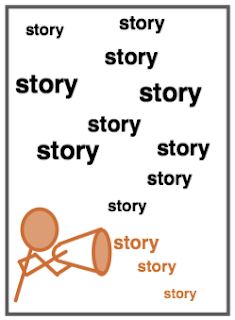 This is not pulling a lever or pushing a button; it is not "launching" or "performing" a story; but it is the most effective method of making change happen using narrative that I know of. Perhaps organizations like the group that runs American Voices would do well to consider a "sister arts" approach where every performance and educational opportunity carrying American music and culture abroad is matched with a performance and educational opportunity running in the opposite direction. Perhaps "Porgy and Bess with the Orpheus Choir of the Bangkok Opera, Thailand" could take place on the same day as "The Korphai Ensemble with the Pittsburgh Symphony, US" (followed by a class in the subtleties of traditional Thai musical instruments for local musicians). "In addition to performances and educational programs, American Voices is also proud to have made over 100 donations of American music scores to conservatories, municipal and national libraries around the world." "In addition to our mutual-exchange performances and educational programs, we are also proud to have made over 100 donations of music scores and recordings drawn from every musical tradition to conservatories, municipal and national libraries around the world." That would send a different message to the world, wouldn't it? And the hive would respond differently, I am sure. "Our goal is to make that experience [telling and hearing stories] accessible to all, and find new ways to inspire people to record and preserve the stories of someone important to them. Everybody’s story matters and every life counts." That is a powerful message, and the people who have made StoryCorps happen have found a wonderful way to spread it. StoryCorps does tell a story; do not doubt that. But it does this not by telling a story but by helping the hive tell its own stories to itself. I love the idea of making stories happen...rather than just 'telling'. Advance the action or reveal the character. Hi Mike, being new to blogging I've asked my blogging mentor (John Caddell) and he said it IS proper to respond to blog comments. So, thanks for the kind words! I hope this stuff is useful to people making decisions about reaching people.